I have scored some nice deals in my life, but this one is certainly among the sweetest. While browsing through a local auction service a while back, I've noticed one seller who was basically giving away tons of hardware and software. I looked through his list and diceded to go with Dreamcast peripherals. The guy had some positive feedback so I figured "why not?". 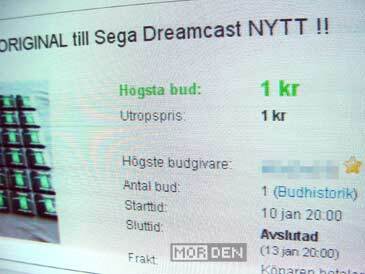 I bid 1 [yes, ONE] Swedish krona [that's 0,11 US Dollars] on a set of 48 US Dreamcast memory cards and wouldn't you know it, I've won. The guy really took his time before I got the goods but today I picked up a 5.8 kilogram box full of Visual Memory Units. I knew the seller wouldn't try to screw me out of money since he sent me an invoice, so I wired the money after I've opened the box. 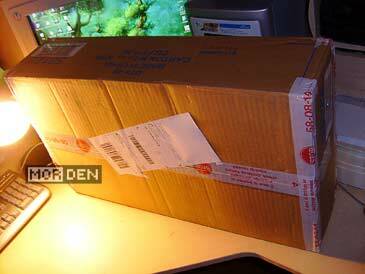 After all, aside from the 0,11 dollars for the cards, I had to pay 27 dollars for the shipping. With a deal like this it's kind of hard to believe that everything is ok. I thought that maybe they were cheap knocko-ffs or maybe they were damaged. Everything was ok though. Memory cards are original US Sega hardware, all in skeleton green cases. 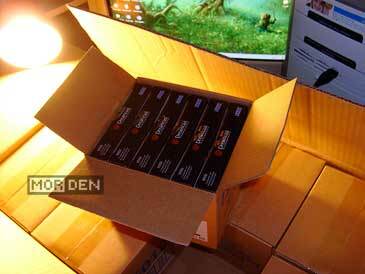 The package contained eight boxes, six cards in each one of them. 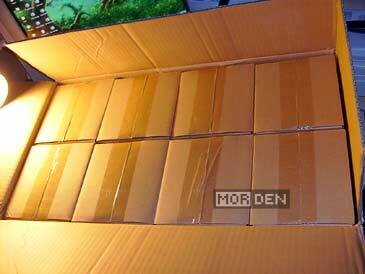 All packed by the manufacturer, brand new, never before opened. 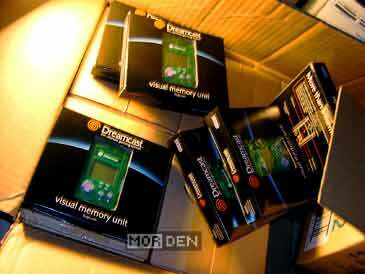 Having 48 VMUs, now I can rest assured that I will never run out of memory. And if I do, I can always use the Dream Explorer tool on each and every one of the cards to release those 41 unused blocks. All the excitement aside, I have to say one thing. Sega really had it going on with Dreamcast. The console rocked. 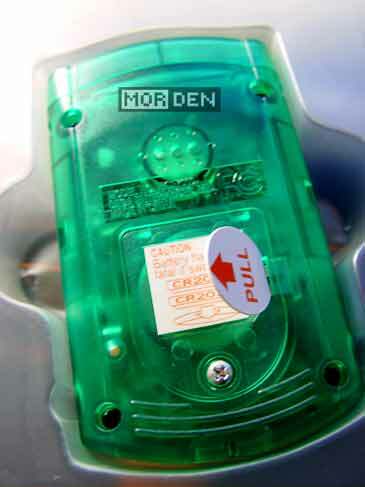 It was ahead of its time, it was the first 128-bit system, it was the first home platform to make proper use of the internet [not counting Saturn NetLink and Genesis X-Band modems], it used custom discs, double the size of CDs and it got the VMU, probably the most innovative memory device seen to this day. 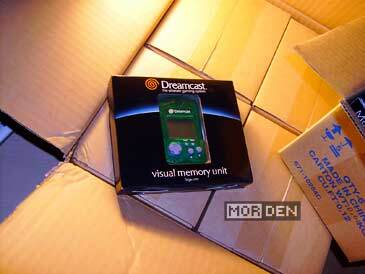 For those who aren't really sure what Dreamcast VMU really is, it's a memory card. But it doesn't end here. 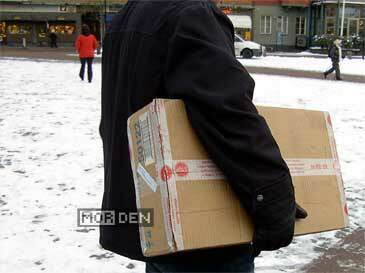 Except for being a portable storage device, you can play games on it. Simple as they might be, they're still games. There were many Dreamcast titles that used VMUs extensively, Sonic Adventure being a particularly good example. In Sonic Adventure you could catch a Chao creature and transfer it onto your VMU. From there you could train it, feed it and so on, much like a Tamagotchi. It grew stronger and faster and you could later transfer it back into the game and participate in races, etc. Sounds like fun, right? It sure was. 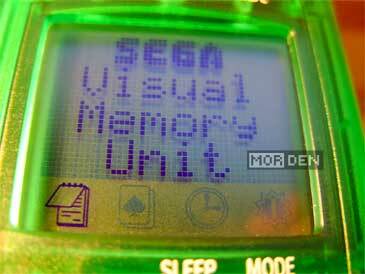 The VMU also served as a status display in many Dreamcast games. When plugged into the controller, it would show various things depending on a game. Some would display a static logo, some would show animation, but there were also those games that would show you useful information, like Resident Evil: Code Veronica. The game would show you your health in a form of the standard EKG readout. Another cool feature was the ability to connect two VMU units with each other. The connector was designed so that two memory cards could be connected with each other directly. By doing this, you could swap save files with someone or even play a two player game. It seems like the idea of mini game devices serving as memory cards was appealing enough for Sony, so a year after Sega they released their own hardware, calling it PocketStation. 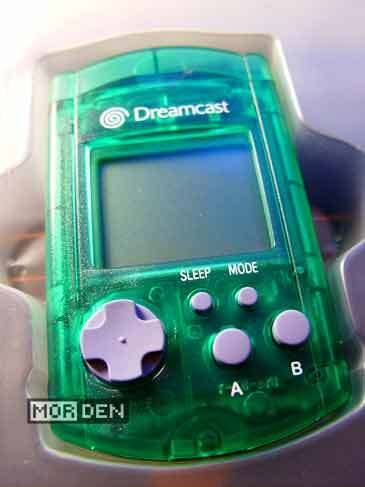 We all knew it was a VMU ripoff though and it enjoyed an even shorter life than Dreamcast. Ok, that's enough for today. I'm off to do some heavy saving and I'll be back to post about Quaker Wars. 2009.02.13 Fri Dreamcast ☆ Saturn Comment Tweet This!